I've been trying to determine what I'm going to do with my Valentines Day card this year for the hubby. It's the only thing we do, exchange cards. He gets off easy and never needs to find me that "right" gift. Only a card and I'm happy! 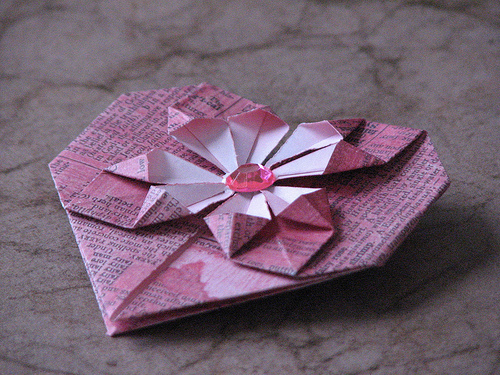 This year, I'm leaning towards adding origami hearts to my card. I've been obsessed with making them lately. Here is where you can find some great instructions on how to make these. I've been making several of them but have misplaced my camera to show you the photos. For my card, I'm thinking about placing several types of hearts on the front and going with something like... "Love takes on many forms...." "Inside might be something like "I love our form the best" I have some left over embroidered hearts to use as well.